6. When Can Coaches Assess? 7. Which Assessments Will Be First? 8. How Will Coaches Assess? 11. The progression of program component assessment criteria in STAR 1-5. A roll held for several beats of music during which, when skating backward, the free leg lifts and then first swings forward, then backward past the skating foot, then back beside to skate the next step. When skating forward, the free leg first swings backward, then forward and then back beside to skate the next step. The swing of the leg gives the sense of a rolling movement. The following will provide coaches with the guidelines and procedures to assess skaters throughout the STAR 1-5 program. Before coaches can conduct assessments in their club/school, an Assessment Procedure must be determined in conjunction with the Assessment Coordinator and fellow coaches. See Assessment Coordinator duites for more information. To enable maximum opportunity for skill progression and development, assessment in the STAR 1-5 program must be available in a convenient, timely and low cost manner. Coaches will conduct all assessments from STAR 1-5 in all disciplines. Clears the pathway for development by removing time and logistic barriers. Skaters will have access to assessment opportunities as their skill development progresses. Without the demands of readiness dictated by a pre-set test day calendar, skaters are free to move through the program at their own rate without obstacles. STAR 1-4 assessments, as well as most STAR 5 assessments, are designed to be available to the skaters on their regular session, during their normal time slot. This allows the assessments to be convenient and does not require additional ice fees or travel costs for external evaluation. Enables equal opportunity to all skaters regardless of geographical location in Canada. Being able to use the club coach to perform assessments enables all skaters in every region of Canada the opportunity to be assessed when ready. This eliminates the geographical advantage or disadvantage, and relying on the availability of officials. During this “Learn to Train” stage of development, the ability to move through the program when ready is a critical component to maximizing skill progression in this “golden age of learning”. Allows coaches to be 100% accountable for skater development. Coaches will have total command over skater development from CanSkate to double jumps. This opportunity is advantageous in ensuring the quality of skater development is consistently monitored, nurtured and encouraged. Costs to the skater is reduced. The STAR 1-4 and some of STAR 5 assessments can be taken at any time during the year on the sessions skaters are currently skating, thus eliminating the need for clubs to purchase additional ice for test days at this level. Coaches should be using regularly scheduled lessons to conduct these assessments to also avoid additional fees to the skater. The other factors implemented to ensure fees to the skater are reduced include the availability of solo or shadowing a pattern dance. All coaches assessing skaters at the STAR 1-5 level of development must complete the STAR 1-5 Assessor Training. Coaches are only able to assess skaters they teach. Coaches may not assess disciplines they do not teach, nor may they assess skaters in the same discipline who are not under their direction. Coaches will be expected to work together to ensure complete understanding of assessment standards and performance quality of skills expected at each stage of development. The coaches must communicate to designate who will assess the skater on a particular day. The assessor role may rotate between coaches at any time within that discipline. A skater has a different coach for each discipline. Assessment will be provided by the coach giving instruction in their assigned discipline. There are two groups of skaters in the same discipline with a coach assigned to each group. The coaches must assess their own skaters from that group. They are not allowed to switch groups for assessment. When assessing dance, the assessor may not be the partner or shadow for the skater that is being assessed. Team coach dance with another coach at the club. This will allow one coach to shadow/partner while the other coach can assess. Our club has a HEAD COACH. They are in charge of organizing all group lessons and scheduling coaches, but do not teach any groups. Can they assess all of our skaters? The Head Coach would only be allowed to assess skaters he/she has been assigned to teach. In this case, they are not teaching any groups. Our club is close to another club. Can we ask the coach from our neighbour club to assess our skaters and we can assess their skaters? Coaches are only allowed to assess skaters they have been assigned to teach. Our club has 2 coaches. Can they assess each other’s skaters or groups? Our dance coach wants to partner or shadow his/her skaters. Can we video the dance and they can assess it after? All assessments must be done in real time. Our dance coach wants to partner or shadow his/her skaters. Can they ask another dance coach to come in and assess the skaters? Coaches are only allowed to assess the skaters they have been assigned to teach. STAR 1-5 is an “introduction” to figure skating. Skaters entering the program should be able to perform all skills in the CanSkate Stages 5 & 6. The sport of figure skating has a strong technical focus. It takes time for skaters to develop the skills necessary to be proficient at certain techniques. The STAR 1-5 program is designed to allow skaters to follow the Pathway of Development and be recognized for achievement at the various stages. A “continuum of development” has been developed for the STAR 1-5 level skater that fits into the broader pathway of development for LTAD. Skills are confident and fully acquired. Technique is still being honed. Skills are completed. Power is being introduced. Concepts are being introduced. Technique is being taught. Skills are recognizable and have room to grow. As with the CanSkate program, coaches are expected to spend an appropriate amount of time concentrating on the actual teaching and development of skills before assessingSkaters should only be assessed when ready. There is no need to rush or push assessment, as coaches may assess their skaters at any time throughout the training season. There are no limitations to the frequency of assessments, nor the number of skaters that may be assessed in the STAR 1- 5 Program. Generally, a busy time with skaters returning after a long break, programs (solos) to be built, review of learned skills and the introduction of new skills. Generally, skaters are more organized with skills and program readiness. Work is being done on performance and skill acquisition. Coaches may find that this time period is optimal for assessments as they can be performed at any frequency in the training schedule. Which Assessments Will Be First? STAR 1 Skills and Freeskate are designed to be the first assessments skaters will achieve. These assessments focus on building a strong foundation for skating techniques that will continue to be developed along the pathway. STAR 1 Dance contains dance steps that require more technical ability and will most likely take longer to develop. The expected performance level of skills at the STAR 1 level, will be “in development” versus “acquired”. The assessment standards for STAR 1 reflect this philosophy. As the skaters progress through STAR 2, 3, 4 & 5 they will develop a better understanding of technique and concepts. Power and speed will be incorporated into their performance and skaters will be introduced to more complex skills, again allowing skaters to develop the technique over time. With the new layout of assessments, parents will have a greater understanding of the skater’s progress, as there are more opportunities to acknowledge advancements in technical and performance acquisition. To reflect the skater’s progress on the pathway of development, the term “for the level” is used repeatedly throughout the STAR 1-5 assessments. “For the level” is the indicator to the coach to be able to asses the performance of the skater based on where they are located on the pathway. To assist coaches, “Continuums of Development” have been created for each discipline. 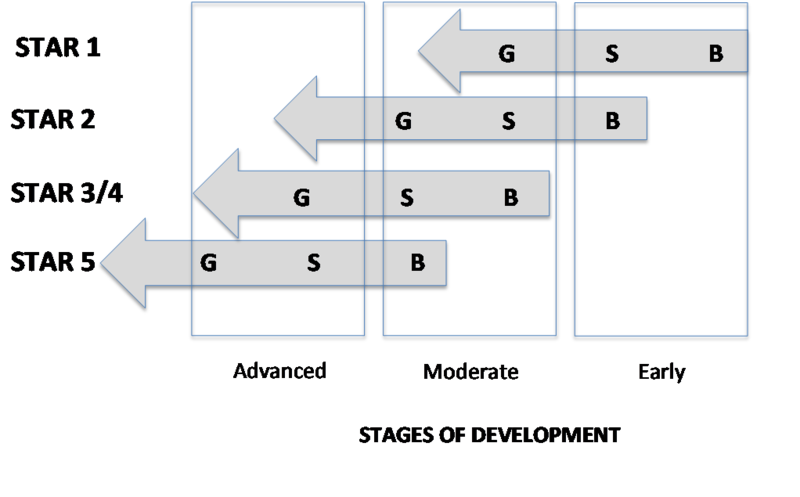 These charts will help identify the level of performance expected at each stage on the pathway. Skaters in STAR 1-5 will be assessed using standards for each element. The following table describes the correlation between the assessment standards of Gold, Silver and Bronze. The term “For the level” will use both the Continuum of Development, as well as the Assessment Standards to determine the appropriate performance level for skaters in the STAR 1-5 program. The chart below shows the 3 stages of development as well as the expected Gold, Silver & Bronze ratings per level as they advance through the program. 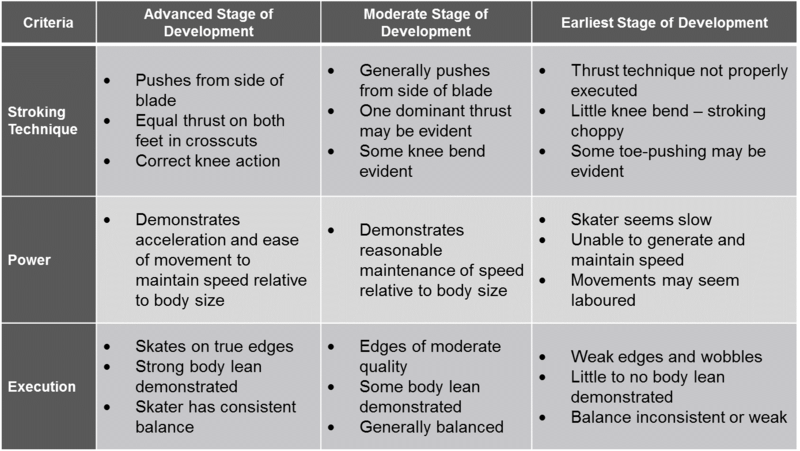 Every skater will go through early, moderate and advance stages of development for each skill and area of technique. A STAR 1 skater will be at the early stages of development in all areas when entering this program. The STAR 1 assessment standards will reflect an “early stage” performance criteria. The performance expectations will increase as the skaters move through the program with reference to “for the level” indicated on the assessment sheets. Each element will have criteria assigned to it to help the assessment process. The criteria is listed on the back of the assessment sheet. Every assessment will have CRITERIA that will be rated Gold, Silver or Bronze. Each element or segment of the assessment will need to establish an OVERALL ASSESSMENT for each element or segment based on the criteria rating. 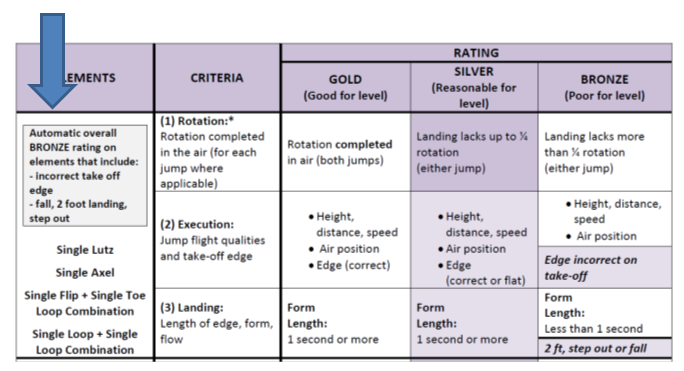 Skaters will need to achieve 2 of 3 criteria at Silver or better to receive a passing assessment for that element. 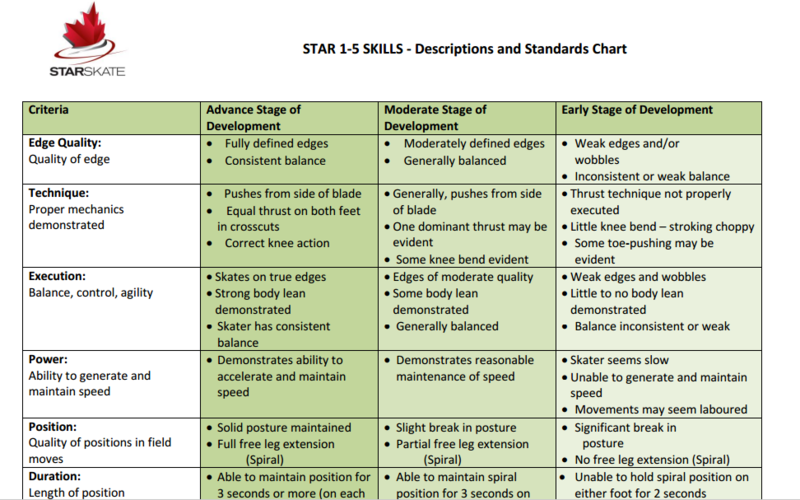 Detailed definitions of the freeskate criteria can be located in the STAR 1-4 Judge Resource Guide. To assist coaches, a continuum of development has been established for all criteria and can be found at the beginning of each discipline’s Descriptions and Standards Chart. Criteria may be used in several disciplines as skating often has components that cross into more than one area. Below is a quick reference chart to indicate the criteria and how it is used in each discipline where applicable. Turns: Used to assess the quality of the 2 second glide in and out of the turn. Spins: Used to assess the number of revolutions performed by the skater on the correct spinning edge. Elements: Describes the quality of biomechanics used to do the actual element. In skills, this could be a push, turn, change of edge, slalom or series of edges. Program - Skating Skills: Used to assess the biomechanics used for general skating and turns. Elements: Used to assess the biomechanics needed to perform the dance steps as well as the accuracy of the actual steps. Patterns: Used to assess the ability to perform the correct steps using the proper biomechanics. Describes characteristics that contribute to the overall performance of the element. For elements and stroking, this is used to assess the balance, control, agility and form the skater displays in performance. This also includes stability. For field moves, this relates to the balance, control and edge quality of the field move. Jumps: Used to assess jump flight qualities including height, distance, air position, as well as the quality of the take-off edge. Spins: Used to assess spin qualities including centering, speed of revolutions, exit or completion of spin and take off where applicable. Program - Skating Skills: See definition used for stroking in SKILLS. Elements: Used to assess the balance, control and depth of edge required for successful performance. Used to assess speed and knee action during the stroking exercises. Program - Skating Skills: Used to assess speed, acceleration and knee action for general skating. Used to assess the position performed by the skater for each field move. Used to assess the quality of the position performed by the skater for each spin, as well as the duration of the position. The count for the duration cannot start until the definition of the position has been achieved. Used to assess the length of time skaters hold a field move or spiral once they are in the position. Jumps: Used to assess the degree of rotation executed in air by the skater. Jumps: Used to assess the quality of the landing position and the ability to maintain control for a duration of time. Program - Performance: Used to assess the general body carriage or posture by the skater. Elements and Patterns: Used to assess the skater’s style, body lines and posture. This includes leg extension. Program - Performance: (program): Used to assess how the skater performs their movements. Program - Interpretation: Used to determine how the skater is able to match or highlight the music. Patterns: Used to assess the ability of the skater to recognize and match their steps with the timing of the music. Program - Transitions: Used to assess how the skater is able to transition from one element to another with ease and maintenance of speed. Program - Transitions: Used to asses the level of development used for linking elements. The program component assessment criteria will increase as the skaters progress through the levels. The rationale for this is to ensure the priority is placed on the performance and growth of the skill acquisition during this “golden age of learning”. 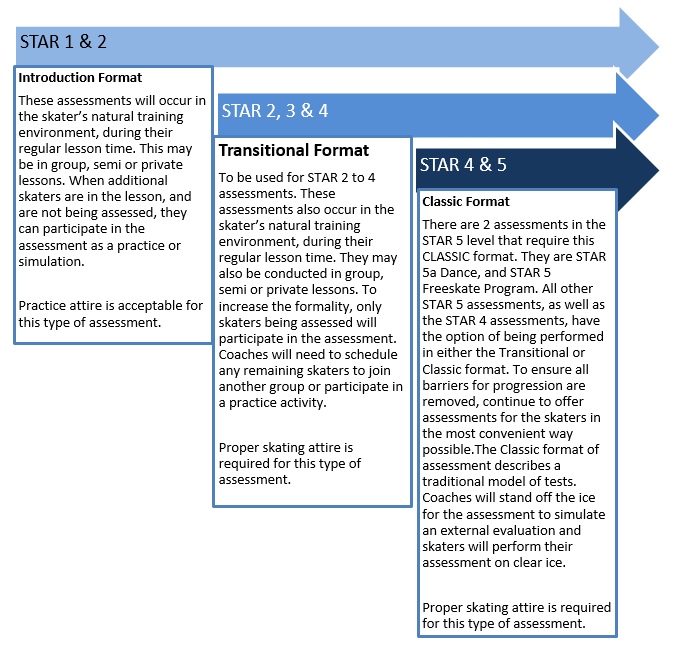 The progression of program component assessment criteria in STAR 1-5. Starting at STAR 2, there will be some criteria that is bolded and asterisked (*). This indicates that this criterion is mandatory for the skater to complete at Silver or better, to achieve an overall passing grade for that element. STAR 1 does not have any mandatory criteria due to the philosophy that the skaters at this stage are “in development”. The main focus should be placed on rewarding quality. While in development, skaters may make mistakes while acquiring strong technique. Rather than ask skaters to reduce speed, height or power for a “safer” performance, coaches can train the skaters for maximum performance, knowing that if the skater falls, the element can still receive a passing grade. Skaters will be expected to execute more control at STAR 2. Some assessment sheets may have areas that need to be marked “successful” in order to receive a passing grade. These areas appear on pattern dances as well as Freeskate Programs. 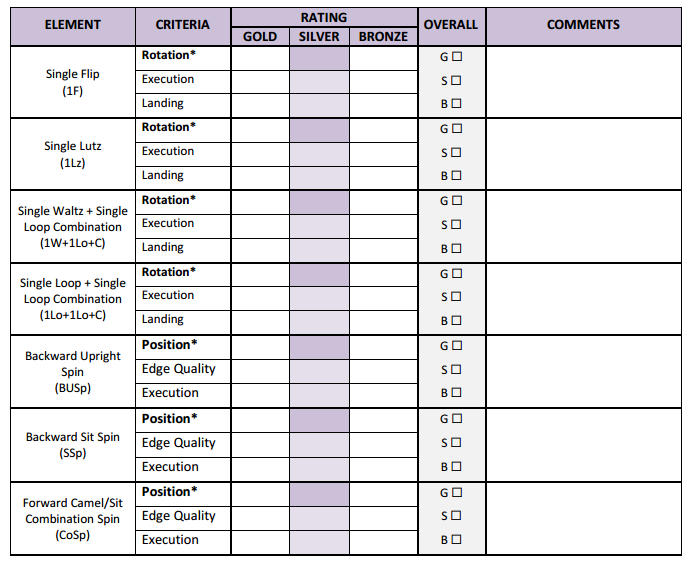 STAR 4 & 5 Freeskate Element assessment sheets contain a box in the criteria area that indicate certain criteria that, if performed, result in an automatic Bronze rating of the element. If a skater demonstrates an element that does not meet the definition of the skill, the coach cannot assess it. This results in an automatic bronze rating for the element. Example: A spin with less than 3 revs in total. An overall assessment is determined by the number of ratings given for the criteria, for each element. To achieve a passing grade, skaters must receive 2 or more ratings at silver or better. Please note: If criteria are indicated as mandatory, the overall rating for this element may not exceed the rating given to the mandatory criteria. Coaches will place a check mark in the designated box to indicate if the skater was successful or unsuccessful at performing each set of identified steps, for a miniumum of 2 consectutive patterns. Work on neatness of feat for steps 6 & 7, with more lean for definite edges. *Minimum 2 Focus Areas rated Successful? Each criteria for the full pattern assessment will be marked as a whole. Coaches will place a checkmark in the gold, silver or bronze column and indicate the overall assessment in the overall column, using the first letter of the rating. The overall ratings will then be tallied in the “Total Overall Assessment” boxes at the bottom of the assessment sheet. Love your posture and extension in this dance. To achieve a PASS, the skaters will need to meet the required number of Silver (or higher) assessments indicated at the bottom of the assessment sheet. To achieve a PASS with HONOURS a skater will need to achieve the required number of Gold assessments indicated. Coaches will total the overall ratings for EACH element or segment. Record the total number of overall Gold, Silver or Bronze elements at the bottom of the sheet. Determine the result by matching the totals in the Gold and Silver tally boxes with the requirement to pass the assessment. STAR 1-5 assessments will increase in formality as the skater progresses along the pathway of development. There are 3 formats to use when assessing. NOTE: If the arena is exceptionaly cold, please make provisions to allow the skaters to dress appropriately for the temperature of the arena. Keep the assessment fun. Lots of smiling. Coaches may talk to skaters between elements. When introducing and teaching the elements to the skaters, teach the specifics of the Silver & Gold standard. This will allow the skaters to identify their performance level during practice and assessment times. Prepare a place (binder) for the collection of the top portion of the assessment sheets. More formal conduct during the assessment. Maintain a pleasant disposition. Coaches may talk to skaters between elements. Invite an external evaluator to observe the assessments. This can introduce skaters to the next level of assessment format. Inform parents and skaters with a letter or verbal update/instructions. Skate Canada Assessment fee must be collected before the assessment. Conduct assessment and record performance on the appropriate Skate Canada Assessment Sheet. Give bottom of the sheet to the skater and provide verbal feedback. Ensure the skater has both sides of the assessment sheet. Decide if clear ice needs to be booked, or if assessment can take place on session with skaters at boards. Regardless of level, skaters must perform all of the elements or components required for an overall result, during the assessment. Skaters should be allowed to warm up their elements before being assessed. As most assessments will be conducted on regular skating sessions, this should not be an issue for most clubs/schools. There is no “official” warm up times allocated for the STAR 1-5 assessments. Coaches may use their discretion in this area. All pattern dances in the STAR 1-5 Program require a minimum of 2 patterns to be skated with the exception of the Swing Dance which requires a minimum of 1 pattern. Coaches may exceed the number of patterns performed as necessary. The general rule is 2 re-skates per assessment with the exception of STAR 3 & 5 in the Skills discipline. These assessments only have 3 elements to be assessed. Skaters are not allowed to “re-skate” a dance pattern. Coaches are able to continue the music to enable skaters the option of completing another pattern or patterns of the dance to clarify or correct performance. Skaters are not allowed to “re-skate” a freeskate program. Coaches may have the skater perform any elements of the program that were interrupted and not able to be attempted, due to other skaters on the session. The purpose of this allowance would then enable the coach to check off any elements not able to be “attempted” in the program due to circumstances beyond the athlete’s control. This is a mandatory box for a successful assessment. During assessments please be aware of the session flow. For busier sessions, coaches may choose to stand closer to the boards. This will ensure they do not disrupt the skaters on the ice and/or present a safety hazard. Another skater gets in the way of the skater being assessed when performing a dance. The coach assessor can allow the skater to perform another pattern, or ignore the interruption if it was minor. The skater’s skate lace breaks during the performance. Allow or help the skater find a solution and resume the assessment. The facility experiences a power failure. Evacuate the ice as per the EAP (Emergency Action Plan) and make arrangements to resume the assessment when safe to do so. As skaters are skating on regular sessions for assessment, coaches may need to use strategies to identify the skater being assessed to inform other skaters or coaches on the ice. This action would increase the opportunity for the skater being assessed to perform without interruptions. A bell could be rung before the music is played for a dance or program to indicate skaters are being assessed. Coaches may use a double panel approach for the assessment of pattern dances. This can be done when there are 2 or more coaches that have skaters ready to be assessed on the same pattern dance. One skater would start their dance at one end of the ice, while the other skater at the opposite end. Coaches would watch their respective skaters. Music will continue until both coaches have decided enough rounds have been performed. Coaches may use an alternating panel approach to maximize ice time during multiple freeskate program assessments. For example, if Coach A has 2 skaters ready for a program assessment, and Coach B has 3 skaters ready, they may alternate the skater’s programs to allow Coach A to make notes and connect with the skater that just performed while the skater for Coach B is performing their program (and vice versa). Coaches have the option of using an event to assess freeskate programs at the STAR 4 & 5 levels only. The event would simulate the Classic Format of assessment available to this level of development. All assessments performed at events must comply with all club/school Assessment Procedures agreed upon by the Test Chair. Skaters will be expected to be prepared to be successful for each assessment however “re-trys” may occur due to nerves, stress or illness. All assessments must be paid before the assessment takes place and must be recorded on the summary sheet. Coaches may use a system of symbols or shorthand to record aspects of the skater’s performance. This will allow the coach to quickly record quality comments and will assist in determining the criteria rating for each element. A sample list of short hand symbols can be found in the STAR 1-4 Judge Resource Guide however coaches may use their own short forms as well. When assessing, coaches are expected to act as an assessor only. Coaches may give instructions pertaining to the assessment and skill order, but may not give corrections or coaching tips to the skaters during the assessment. When assessing a dance pattern, the assessing coach may not be the partner or shadow. Ensure ALL information is filled out correctly. Upon completion of each assessment, the top portion of the assessment sheet will be given to the club Test Chair. This information will serve as a record of the assessment. It will be recorded on the summary sheet and saved for future reference if needed. Fill out Additional Comments section with final feedback. This is sometimes located on the back of the sheet. Ensure the result matches the result section the top portion. Ø Recognize aspects that have been performed well or strong effort. Ø Identify areas that need attention or further development. “Wow, great start. Looking forward to seeing the development of more power and height in the next level!”. Coaches may also use “Shorthand” or “Symbols” to help them record assessment qualities. A guide for this type of shorthand can be found in the STAR 1-4 Judge Resource Guide. Toe Push: Weight and thrust is all on the toe picks. This type of push is not expected in STAR 1-5. Flat of the blade push: Weight and thrust is all on the middle of the blade. Toe does not touch the ice. This type of push is accepted as a “Blade Push”. Blade to toe push: Weight and thrust starts on the middle of the blade and ends with the toe pushing of the ice for a finishing action. The majority of the push is generated from the blade. This type of push is accepted as a “Blade Push” as long as the majority of the push is generated from the blade. Figure form describes the way in which the skater holds their body and moves their limbs when executing an element. Coaches will be able to adjust the order of movements according to the skater’s needs and technique philosophy of the coach. The overall carriage of figure form must be maintained throughout the element. Figure form is often described as a quiet, controlled movement. Be sure to refer to the video examples/tutorials, as well as the definition. Start the count for duration once the skater has established the definition of the position being executed. The X & O patterns are designed to allow coaches to continue the development of basic power generation. Basic crosscuts are repeated at each level. In STAR 3, the 2-foot to 1-foot slalom exercise is designed to encourage the development of power initiated from the blade and bend of the knee versus from a traditional push. This philosophy continues in STAR 5 with the quick edge exercise, as well as adding a transfer of weight to the technique. Developing the ability to generate speed from the blade without a push is instrumental in our sport. Ensure the skater is allowing their upper body to twist and lean while performing these exercises. This natural movement will encourage power, rhythm and timing. STAR 5 may or may not use clear ice for the stroking pattern. STAR 1 Stroking – Skaters will train starting from both directions, however will be able to choose their starting direction for the assessment. STAR 3 Stroking - Skaters will train starting from both directions, however will be able to choose their starting direction for the assessment. STAR 5 Stroking 1- Skaters will train starting from both directions, and have to do a DRAW for their starting direction for the assessment. The progressive technique is very distinctive with the definite placing of the “progressing foot” and the finishing placement of the “under push” foot. Skaters must be able to demonstrate proper progressives in the dance discipline, as a “crosscut” technique is not acceptable. Be sure skaters know and understand the difference between a progressive and a crosscut. The swing roll technique differs from a forward outside edge largely by the knee action and free leg extension. Ensure skaters know the difference in these performance expectations. Focus Areas or FA’s have been assigned to each pattern dance to highlight the new technique introduced. To achieve a successful rating on a designated as a FA , the skater needs to demonstrate 100% accuracy. This means that the steps are performed correctly with the proper technique and blade pushes. Coaches will be looking for the FA to be performed well on 2 consecutive patterns. Some discretion may be necessary. Coaches and skaters will need to be familiar with the expectations for each FA as found in the Descriptions and Standards. Skaters must complete the dances within a level before moving to the next level. Example: STAR 2a & b must be completed before assessing STAR 3a. When choosing a shadow or partner for your skaters, be sure that skater understands the timing and pattern of the dance. If there are issues during the assessment that are a result of the Shadow or Partner, the coach may have a new shadow or partner do the dance with the skater. The coach may also ask the skater to solo the dance. A 2-foot landing occurs when a skater lands with equal or close to equal weight on both feet. A touch down occurs when a skater lands on one foot and the other foot then touches the ice for balance recovery or due to misalignment. A touch down action is very brief and does not have weight bearing qualities. Coaches and skaters will need to fully understand the different degrees in rotation assessment. Definitions for < (under rotated) and << (downgraded) are located in the Terms and Definitions. They are also fully explained in the STAR 1-4 Judge Resource Guide. 2 – To identify a “position”, the skater needs to complete a minimum of 2 complete rotations in the designated position. Watching the direction of the spinning foot will be a key skill when assessing edge quality in spins. Coaches will need to be able to identify when the blade is spinning on a BO, BI or FI edge. To achieve a successful rating in this criteria, skaters will need to perform 2 complete and consecutive rotations on the proper edge as identified in the Descriptions and Standards. A center in a spin is established when a skater completes multiple rotations in the same spot on the ice. This can be easily identified by examining the spin tracings on the ice, or by landmarking where the skater initiates their spin. Training skaters to identify their center while spinning will be extremely beneficial. A common mistake in flying spins occurs when skaters perform a 3-turn at the end of the take off edge, thus taking off a BI edge instead of the intended FO edge. Sometimes this will occur when a skater’s balance goes to the middle of the blade after hitting the toe on the pivot. Training skaters to take off from the toe pivot will assist the development of maintaining a FO edge take off. Be sure the skaters understand the consequences of performing any of the actions identified in the boxes on the Assessment Sheets for STAR 4 & 5 Freeskate Elements. Programs at the STAR 2 & 3 may be assessed on a regular session. Programs at the STAR 4 level, may be assessed on a regular session or on clear ice. Programs at the STAR 5 level must be assessed on clear ice. All programs require that all elements in the program be attempted. This is indicated the Technical Content portion of the Assessment Sheet. STAR 5 – Freeskate Program is the only assessment that will require skaters to demonstrate a technical element. Skaters at this level must land an axel with a designation of < or better. The assessment coordinator has a vital role to play in a skating club/school. The assessment coordinator is responsible for preparing assessment sheets and forwarding all results and payment to Skate Canada National Service Center. Establish assessment procedures with coaching staff. Ensure skaters are eligible for the assessment or test (pre-requisites must be met). The assessment coordinator shall not permit a skater to participate in an assessment unless that skater has a current registration number and all eligibility requirements have been verified prior to the assessment. Ensure coaches doing assessment are eligible to assess the skater (work with your coach representative on how to monitor this. Be sure to cover “out of club” assessments criteria as well). Prepare assessment sheets (may be done by the coach) and summary sheets (available as digital test entry or downloadable sheet from Info Center). Assessment fees are set by Skate Canada and are currently $12 per assessment. Assessments in the STAR 1-5 program are designed to be introduced in a semi-formal format and progress in formality to prepare the skaters for external evaluation in the Learn to Compete stage of development. Coaches and skaters have an option to use a STAR 4 or STAR 5 event to assess a Freeskate Program. For this option, all assessment procedures must be complied to before the event. NOTE: All STAR 5 assessments require the coach to be off the ice. Coaches may stand in a player’s box, doorway or other designated area. Every club will establish an “Assessment Procedure” that meets the needs of the club, skaters and coaches. To establish this procedure, it is recommended that Assessment Coordinator and coaches work together to find appropriate solutions. Some suggestions are listed below. Establish a system to inform skaters and parents when assessment readiness has been identified. Ensure all paperwork, letters, assessment sheets, etc. are accessible when needed. Ensure a procedure is in place to collect assessment fees PRIOR to the actual assessment. Ensure a procedure is in place for the Assessment Coordinator to collect the top portion of the assessment sheet for records and summary sheet purposes. Assessment summary sheets are to be submitted at the end of each month. A summary sheet may remain "open" for one month to enable assessments to be added as necessary for a maximum 31-day period. All fees must be submitted with the summary sheet. The STAR 1-5 program consists of assessments in Dance, Freeskate and Skills. The chart below is a brief over of the assessments available to skaters at this level. In freeskate, skaters may be assessed on the element portions separately from the program assessments. To achieve a full STAR level, both portions must be passed. Some elements will require the coach to facilitate a “draw for direction” for clockwise (CW) or counter-clockwise (CCW) starting direction. This is done to encourage skaters to practice skills in both directions. The assessment of the skill will only require one direction to be performed. Prepare paper chits with CW or CCW on one side. Skater can then choose one. Coaches will ask the skater to perform the draw. The coach may then use that draw for all skaters being assessed on that skill or allow each skater to perform their own draw. A candidate wishing to be assessed at a club/school other than his/her home organization must secure consent from the home club/school test chair prior to the assessment taking place. This consent will ensure the candidate is a registrant in good standing and has met all of the requirements. The coach who is assessing the skater must inform the assessment coordinators of the results to be recorded on the master record keeping tool at the club/school. Assessment Coordinators will need to verify that the coach assessing the skater (if different from their home club/school coaching staff), is eligible to do so. All coaches involved with this skater’s assessment discipline, must communicate regarding assessment readiness of the shared skater(s). Skaters at the STAR 4 and 5 Freeskate level have the option of being assessed during an event. While the skater performs at the event, the coach will assess the skater as per the assessment sheet designated for STAR 4 or 5 Freeskate Program. The skater’s home club/school test chair must be advised that the assessment will be taking place prior to the event. The assessment fee must be paid prior to the event. Note: The coach will be responsible for ensuring the proper assessment sheet is available at the event for assessment. The following time allotments are estimated time needed to asses 1 skater in each area. If scheduling an assessment day with clear ice, test chairs may allocate a 5 min warm up period for skaters. This warm up period may be extended if there are multiple skaters or partners. Freeskate and dance may share a warm up. Double Panel: This may be used for dance or stroking patterns in skills. Skaters with different coaches start at opposite ends of the ice and commence their full ice pattern at the same time. Alternating Panel: One skater performs a program or dance. While the coach is making notes for the skater that just performed, the next skater will perform their program or dance and be assessed by the other coach. Summary sheets may also be entered via Digital Entry. Regardless of assessment results (Pass with honours, pass, or retry), all assessments must be recorded on the summary sheets and submitted with fees. STAR 1-5 assessment summary sheets must be submitted at the end of every month if assessments took place in that month.